November 2013 ~ Our front yard vegetable garden is looking pretty frosty & frozen these days. 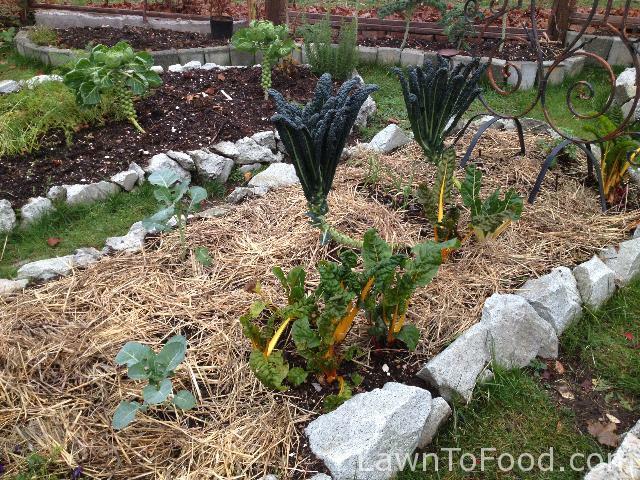 It’s still producing some Kale, Chard and Collard Greens but it has a tucked-in-for winter look. In the spirit of the season, we’ve decided to give back to the garden, in return for all that it has given us. The backyard compost bins have been turned over. A top layer of autumn leaves caps in the warmth, while things continue decomposing. During the compost turning process, we took out about 10 wheelbarrow loads of finished compost, to the front garden for top dressing. A 2 inch layer of black-gold now covers all of the vegetable garden. 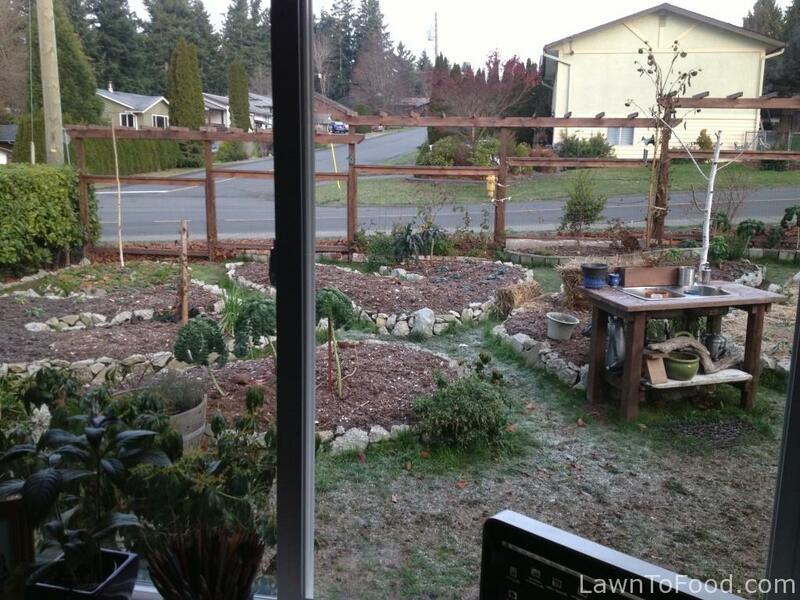 A top dressing of compost over the winter garden. With continual top layers being added, perhaps the beds will stay warmer and the worms will keep working nearer to the surface. 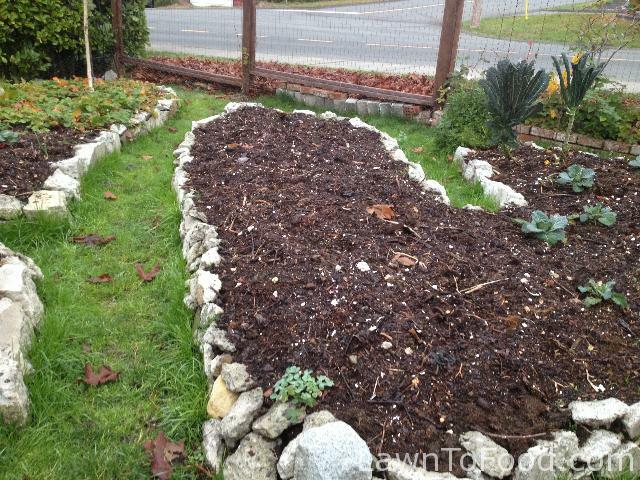 Worms are masters at munching, eliminating and gently folding organic matter into the soil. This build a structured soil, that is less compressed, full of oxygen and therefore, easily accessible for roots to spread out. A bale of straw, leftover from Halloween decorating, ready to spread over the garden. 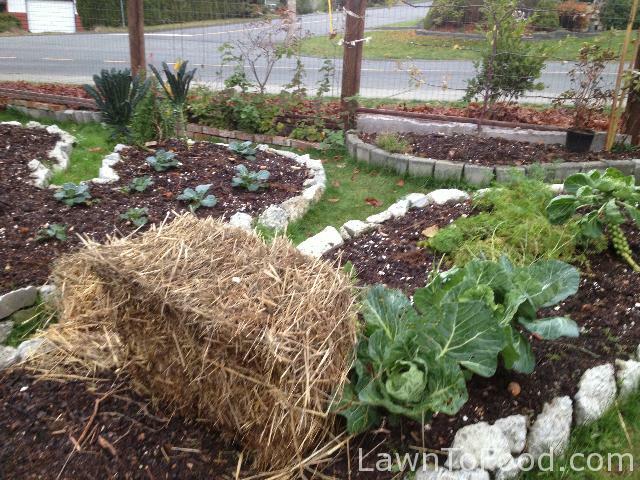 A straw top layer protecting the soil from winter errosion and adding to the soil structure. When we top layer the garden with organic material, it mimics the process that nature uses to nourish the forest soil. 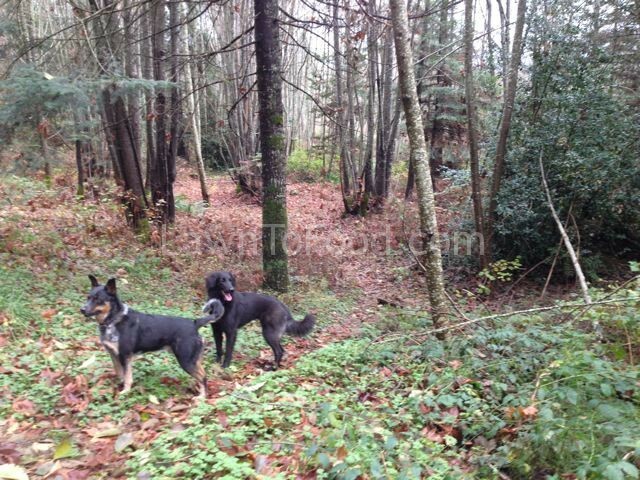 Leaves, branches, moss, bark, fungi, animal feces, fur, and greens all litter the woodland floor at this time of year. As those items break down and decompose, the nutrients feed all things that will grow from the soil. The forest floor littered with leaves and other organic matter. Here are just a few of the many ways that you can feed your soil throughout the winter with household & yard wastes. 1) Leaves – I see so many leaves, raked and bagged up, ready to be taken away. Why not use all of your property’s resources to feed your property? If the leaves are large, run your lawn mower over them a few times, before moving them to the garden. Include houseplant leaves and dried up flowers as well. 2) Grass Clippings – as above, use the resources you have to nourish your soils. 3) Animal Manures – collecting aged manure from a local farms is great for our gardens. We but recycle fish tank waste water directly into the garden. 4) Vegetable Scraps – I’ve been know to dig a small hole at the base of fruit trees or shrubs, to bury a bucket of vegetable peelings & coffee grounds. I particularly like to feed the upcoming summers tomato plot with these scraps. I’ve heard that someone uses an old food processor on her counter top as a compost bucket. Once the processor is full, she wazzes it up and then pours the slurry on to her garden. 5) Paper – we’ve invested in a paper shredder, so all of those bits head straight into the garden. Once wetted down, or lightly covered with soil, they tend to stay in place. Most paper (including newspaper) is printed with soy-based inks these days, so is safe for composting. I do avoid shredding anything glossy though, choosing to recycling those instead. Kleenex tissues are also easily composted. 7) Wood Ash – We use wood as a heat source and I also burn bones after making stocks and broths. This produces quite a bit of wood ash, and chunks of charcoal, that I sprinkle all over the garden plots during the winter months. 8) Seaweed – Since we are luck enough to live near the ocean, we also collect buckets of seaweed to top layer our garden. Seaweed is full of all kinds of nutrients. If you are not near the ocean then try feeding your summer garden with an organic liquid seaweed ferilizer. 9) Wood Chips & Sawdust – We collect these when raking up around the firewood pile or sweeping the woodworking shop floor. We add this waste directly to the garden. Some people say that twigs, bark, needles and pinecones take too long to break down into compost. I say, what’s the rush? The nutrients are still being added to the soil as they slowly decompose and chunky things help prevent soil compaction. Sawdust is particularly good around the base of slug sensitive plants. Slugs avoid sawdust because it sticks to their entire body and makes movement impossible. 10) Odds & Ends – other things that I sprinkle around the garden are crushed seafood shells (dry in oven, put in a paper bag and then hammer them), clothes dryer lint, crushed egg shells, old stale spices, flour, rice or grains (sometimes they sprout, but I just turn the green richness into the soil), tea bags, feathers from old down-filled items, and sediment from wine or juice making. What are you going to feed to your garden this winter? 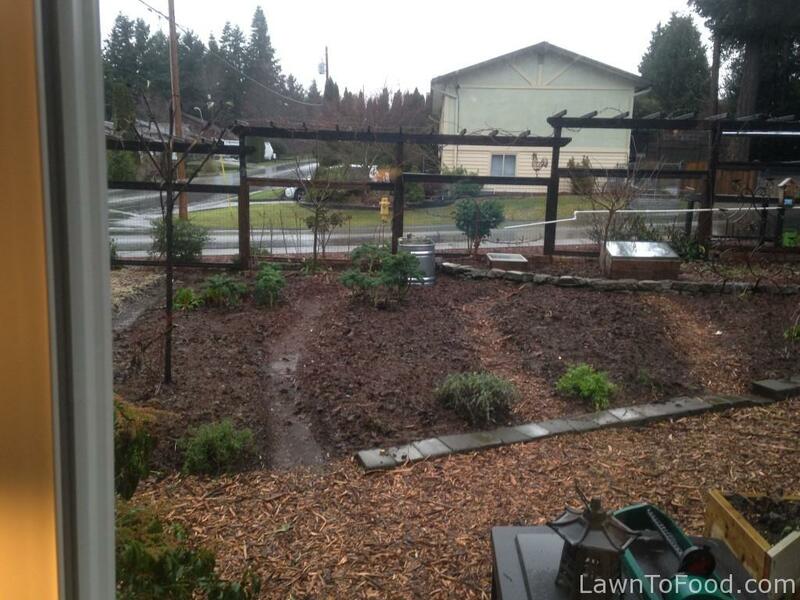 This entry was posted in Compost & Soil Condition, Growing Food, Weeds & Mulch and tagged amendments, compost, feed, mulch, nature, no dig, permaculture, soil by Lynda. Bookmark the permalink.